The Valtra tractor is model T121 producing 160hp. With PTO drive from front and back, it can also be used in reverse drive mode to enable operations from the tractor in both directions ensuring all round visibility. Mulching operations are carried out using a rear mounted PTO driven Noremat 7 metre reach mulcher with 18no double sided cutting hammers. The cutting drum can rotate in both directions enabling mulching operations when driving in forward or reverse. The front mounted weed sprayer has a 1500 litre clean water tank and a separate 90 litre chemical tank. The water and chemical are then mixed in a separate chamber as required when the machine is in operation. The design ensures the water tank will never be contaminated with chemical. This allows drainage on site if required, at short notice, without any danger to the surrounding environment. 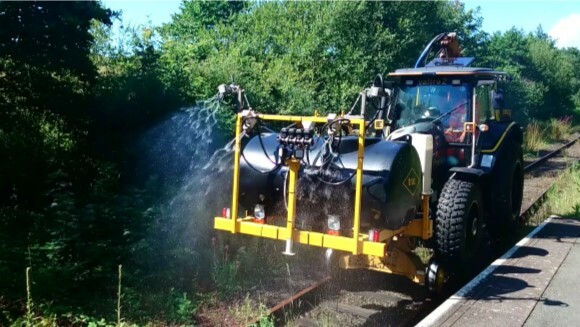 Spraying operations are carried out using 4no forward facing “Radi-Arc” vibrating nozzles. They are positioned in order to spray both the track bed area and the banking areas and can be turned off and on individually from inside the cab. The outside Radi-Arcs that are used to spray the bankings are also adjustable from inside the cab, this allows the spray pattern to be altered from a maximum of 7 meters out down to the ballast shoulder when required, this will ensure continuous site coverage with no gaps in the chemical application when the boundary fence or wall is within 7 metres. Technical specs available upon request.